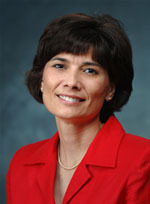 Laurel Greenway Lambert, PhD, RDN, LD, is a registered dietitian nutritionist and food systems management specialist. Dr. Lambert completed her doctoral studies at the University of Southern Mississippi in Hattiesburg, Mississippi. Building upon a healthcare and child nutrition background in foodservice management, her research focuses on child nutrition programs such as the National School Lunch and School Breakfast Programs and school wellness policies addressing the school nutrition environment.